You have got to try this. I know. I know. I pretty much tell you that about every recipe I post here and… this one is no exception. It’s da best. The tea itself is everything you imagine when you think of chai. Exotic spices swirling in a warm, creamy milk mixture. So aromatic and flavorful. Pure Bliss. Your house will smell incredible, too. It is extremely tasty on its own, but I just couldn’t resist and top it with a big dollop of marshmallow whipped cream. This creamy delight is out of this world. So fluffy and saturated with marshmallowy goodness. Instead of using regular whipped cream and topping it with mini marshmallows, I combined the two and was left with the best topping ever. It’s ridiculously delicious. You will never use regular whipped cream again. 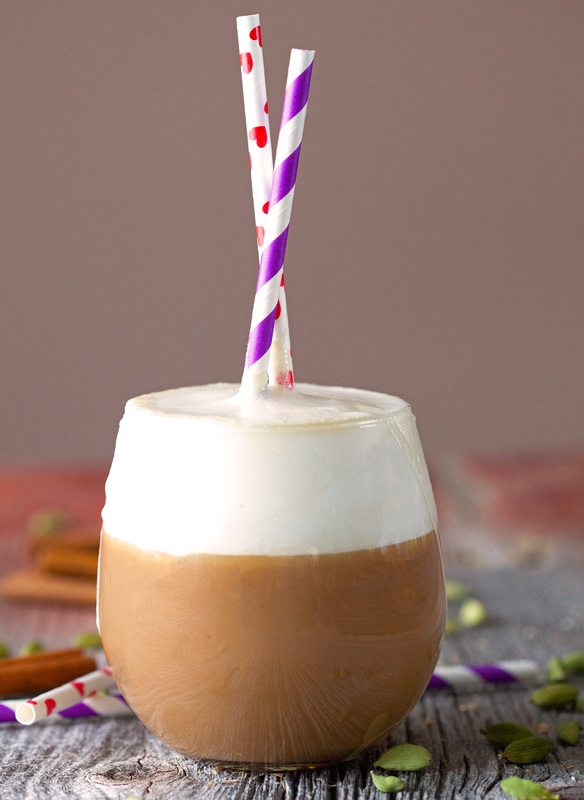 While Marshmallow Whipped Cream might not be traditional to the Indian culture, this chai tea recipe is. It comes from my friend, Di, whose parents immigrated to the United States before she was born. Needless to say, she grew up drinking this fabulous drink and passed the recipe onto us as a Christmas gift a couple of years ago. Being the food lover that I am, I was ecstatic. Food-related gifts are always the best and so are the people who give them! 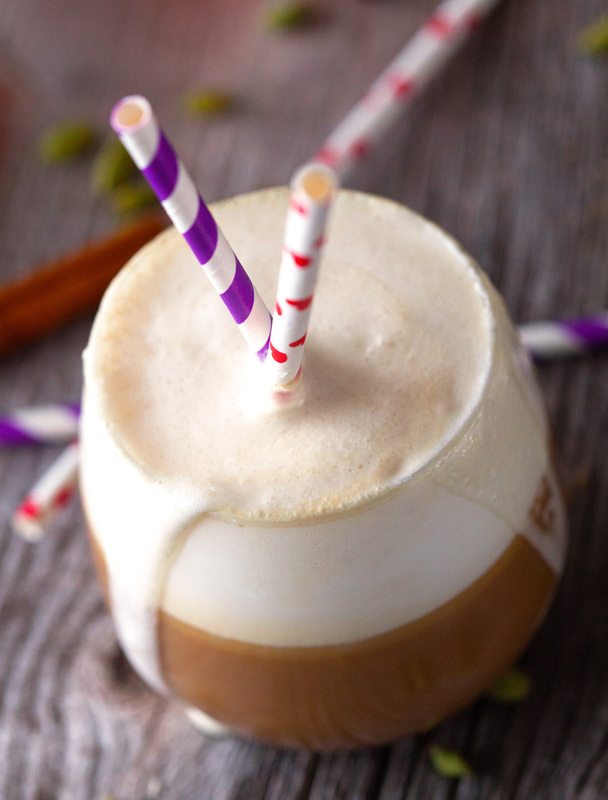 Also, if you’re a chai latte fan, simply add a cup of your favorite coffee to one serving of chai tea and enjoy a homemade latte… a lot more economical and tasty. Promise! 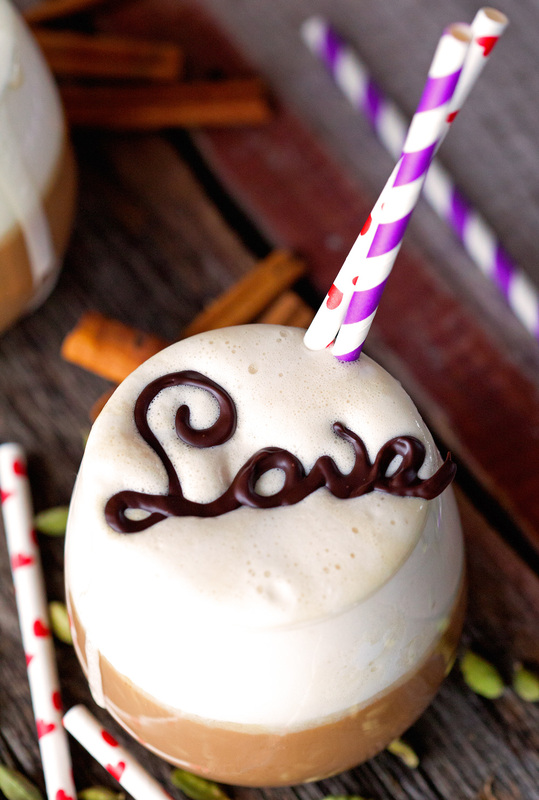 As you have probably figured out by now, this is a great drink to serve on Valentine’s Day. 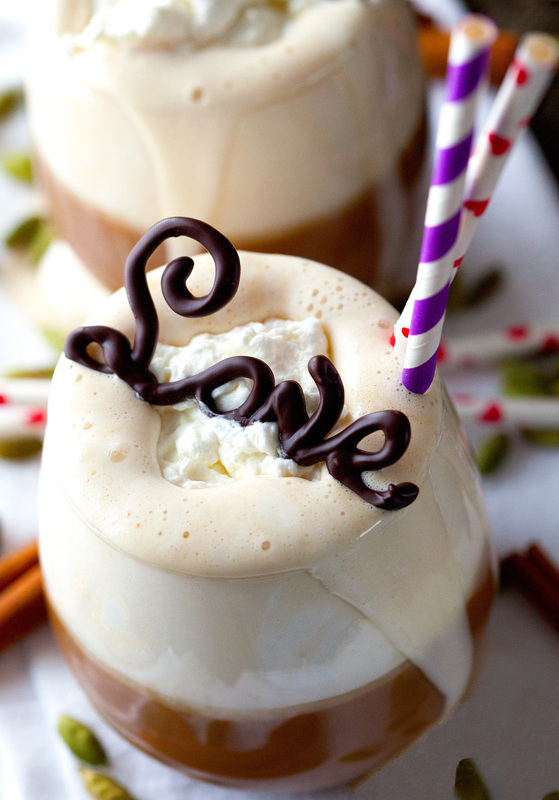 I love this drink and serving it on Valentines’ Day with chocolate words and cute little heart straws, will make me one happy lady. It is really easy to make your own edible chocolate words. I simply created a template by choosing a font in Microsoft Word that I liked and printed the words in the size I wanted. After that I placed the sheet of paper on a baking sheet and put a piece of wax paper on top. I taped the corners of the wax paper to the baking sheet to prevent it from sliding. After that, I melted a handful of chocolate chips and placed the melted chocolate inside a small Ziploc bag. Cut off one corner of the bag and start tracing the words of the template. Place the baking sheet in the fridge for at least 15 minutes or until you need them. This is a great thing to make ahead of time. 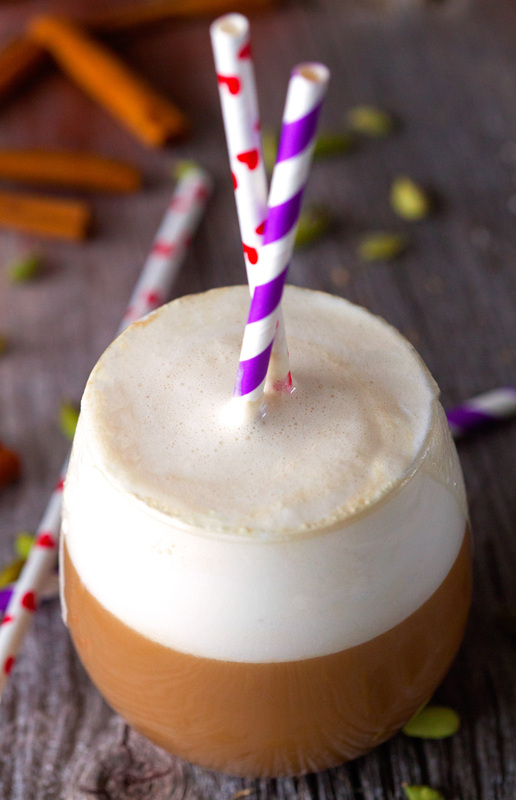 Stay warm and sip on a cup of Homemade Indian Chai today! Homemade Indian Chai Tea topped with a dollop of Marshmallow Whipped Cream. Warming, cozy, and absolutely delicious. 1. In a pot, add 2 cups of water and 1 cup of milk – could use more, but the ratio of water to milk should be 2:1. 2. Take the tags off the tea bags and place in the pot. Then, break the shell of 2-3 cardamoms. Place the seeds into the pot. Add cinnamon sticks, if using. Bring to almost a boil. Then, with a strainer, pour the tea into mugs. Add sugar to taste (usually 2 tablespoons). Stir, top with Marshmallow Whipping Cream and enjoy! 3. To make the Marshmallow Whipping Cream, beat heavy cream until soft peaks form. Add confectioners' sugar and continue whipping until stiff peaks form. Gently fold in marshmallow fluff until fully incorporate. 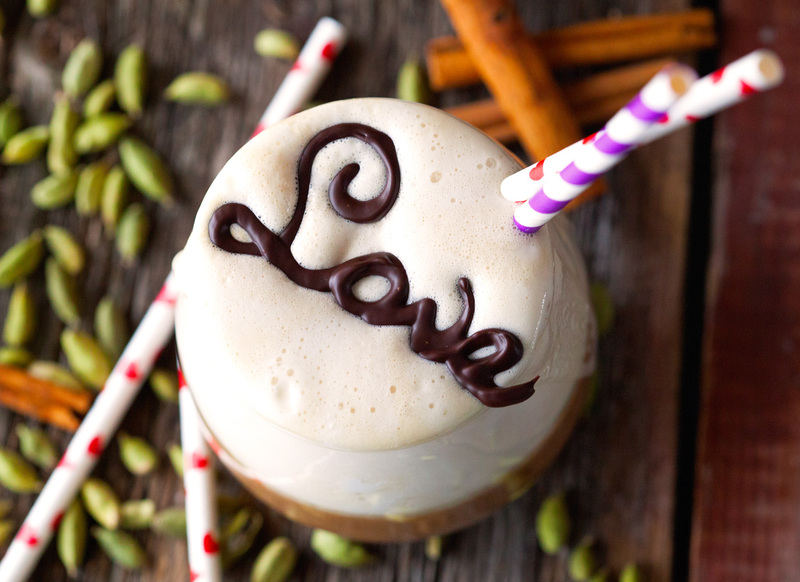 Hi Kathi, this chai looks absolutely divine! Could you please tell us which brand of masala tea bag you use? Can I use regular black tea bags since there’s cardamom and cinnamon in the recipe? Also, thank you for the sharing how to make those edible chocolate words. They’re so pretty! Hi Nadia, thanks for commenting! I used these tea bags http://www.waghbakritea.com/wagh-bakri-tea-bags.php as they are available at our local Indian store. I am sure you can use regular black tea bags as well. I would probably browse my grocery store and look for a black tea that has spices like cinnamon, cloves, or even ginger in it. If you can’t find that, feel free to add some whole spices like star anise, cloves, or even peppercorns to the milk mixture. Whatever you can come up with, I’m sure it’ll be delicious. Without a doubt, Sarah! I can’t think of a better way to start your morning. this looks SO good. I’m going to try to make a chai cream pie and I wonder if your marshmallow topping will have enough body to put on the pie as a topping? I don’t think so, Adele. It’s meant as a topping for a beverage and probably wouldn’t hold up well on a pie. Thanks for asking!